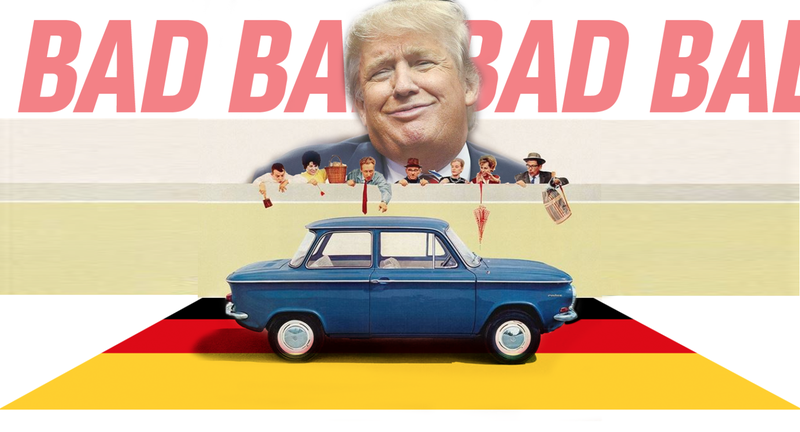 Yesterday, noted local President of the United States and admirer of Grimace Donald Trump made the bold claim that Germans are ‘very bad’ and threatened to halt sales in the U.S. of German cars. The truth is, though, that German car companies build a crapton of cars in America, and are the biggest exporter, by value, of cars from the U.S. If you compute the total dollar value of cars exported from the United States, you’ll find that we export $53.8 billion worth of automobiles. That puts us at number three globally, behind Germany and Japan, in the one and two spots, respectively. Of America’s 50-something-billion-dollars worth of sweet, sweet car, BMW’s South Carolina-based factory provides and astonishing $10.5 billion dollars of exported car value. That’s an easy one to track as all BMW X3, X4, X5, and X6 models sold in the U.S. are built in the U.S. at our factory in Spartanburg, SC. In 2016, BMW brand sold a total of 313,174 vehicles in the U.S. Of that number 103,943 were U.S. produced vehicles - the BMW X3, X4, X5, and X6 – and accounted for 33.2 % of the total BMW number sold in the U.S.
As for YTD 2017 – through the end of April - the U.S. produced X models have accounted for 37.7% of total BMW brand sales thus far. The remainder of Spartanburg’s production in 2016 – nearly 70% - was exported to our markets around the world. The value of BMW exports from the U.S. in 2016 was more than $10.5 Billion making BMW the highest value exporter of vehicles from the U.S. according to the Commerce Dept. So, of the total value of exported cars, the ‘very bad’ Germans who work at BMW and operate a factory in South Carolina provide right about 20 percent of the total. That’s huge. It’s not just BMW that’s building cars in America, either. Well, to be fair, I guess you really could say “a few states in the Southeast of America,” because pretty much every factory is there. Volkswagen builds Passats and will build the new Atlas in their Chattanooga, TN factory, Mercedes has a factory near Vance, Alabama where they build the GLS-,GLE, and C-class Mercedes-Benzes, along with a re-assembly plant in South Carolina where they put together Sprinter vans that have just evaded the Chicken Tax. Yes, Germany sells many more cars in America than American companies sell over in Germany. That’s true. But it’s worth noting that there’s many, many German-badged cars in the United States that are built right here on our own Dixieland soil, with actual American workers building those cars. Halting sales of German cars in America would be a bad idea for a variety of reasons, and unless there’s going to be exemptions for German cars built in America, such a ban would be shooting ourselves in our own tire. Not that any of this matters, anyway, as Germany doesn’t negotiate trade deals unilaterally, as it’s part of the European Union, which negotiates trade as a bloc.